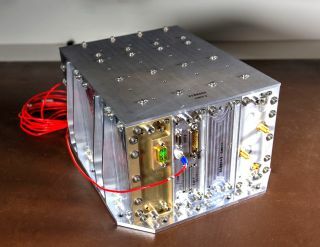 NASA's NavCube project could power an X-ray communication demonstration in space. New technology could use X-rays to transmit data at high rates over vast distances in outer space, as well as enable communications with hypersonic vehicles during re-entry, when radio communications are impossible, NASA scientists say. The technology would combine multiple NASA projects currently in progress to demonstrate the feasibility of X-ray communications from outside the International Space Station. The effort to use another type of light, X-rays, for communication started with research on NASA's proposed Black Hole Imager. That mission is designed to analyze the edges of the supermassive black holes that previous research suggested exist at the centers of most, if not all, large galaxies. One potential strategy to enable the Black Hole Imager was to develop a constellation of precisely aligned spacecraft to collect X-rays emitted from the edges of those black holes. Keith Gendreau, an astrophysicist at NASA's Goddard Space Flight Center in Greenbelt, Maryland, thought of developing X-ray emitters that these spacecraft could use as navigational beacons to make sure they stayed in position relative to one another. The system would keep them aligned down to a precision of just 1 micron, or about one-hundredth the average width of a human hair. "As mankind moves further out into the universe, being able to communicate with home will require new technologies," Gendreau said. "XCOM will play in that." One advantage that XCOM has compared to laser communication in deep space is that X-rays have shorter wavelengths than the visible or infrared light typically used in laser communication. This means that, in principle, XCOM can transmit more data for the same amount of power that laser communication requires, Gendreau said. Moreover, because X-rays have shorter wavelengths, they can be transmitted in tighter beams than visible or infrared light, so less energy is wasted in trying to communicate over vast distances, he added. Moreover, X-rays can penetrate obstacles that impede radio communication. "Remember the radio-frequency blackout in the Apollo days, when the capsules were entering the atmosphere?" Gendreau said. "Well, high-energy X-rays can make it through the hot plasma that blocks the radio waves." To experiment with XCOM, the researchers developed a device called the Modulated X-ray Source, or MXS, which generates rapid-fire X-ray pulses. MXS is slated to get installed on an experimental pallet that will be deployed outside the International Space Station in 2018. MXS will transmit data via X-rays about 165 feet (50 meters) to the Neutron-star Interior Composition Explorer (NICER), which is designed to study neutron stars and their rapidly spinning relatives, pulsars, and will launch to the International Space Station in early 2017. MXS' data transmissions will be run by NavCube, a NASA computing and navigation platform. Although most of the technology for MXS is ready, the researchers are still seeking additional funding to complete a space-ready version of the XCOM device, including its housing and high-voltage power supply. "We have most of the hardware but need a little more support to complete the XCOM package," Jenny Donaldson who is leading the development of the NavCube payload, said in a statement. "This is a great opportunity to demonstrate NavCube and, if all things go as planned, X-ray communications." X-ray modulation could enable more than deep-space communications. "For example, there is a real possibility we could significantly reduce the radiation doses in medical X-ray imaging using this technology," Gendreau said. "I like how a black hole imaging mission can enable real down-to-earth medical applications that can make a difference."